Over the years the state of California has spought to ameliorate the cruel and harsh sentencing of youth who committed their crimes between 14 to 17 years of age. Two years ago SB9 was passed. This law gives these youth the opportunity to be united to their families one day. Since then California has become one of the leaders in passing laws to help kids that were sentenced to cruel and harsh sentences like LWOP (life without the possibility for parole). As we know, we are the only country in the world that gives LWOP to youth. In states that still give a LWOP sentence, these children face the fact that they may never be with their families again. Jody Kent in Washington, D.C., the leader of the national campaign to end LWOP and insure that no children ever get sentenced to life in prison without possibility of parole, collected 500 letters in many states from incarcerated youth who received a sentence of LWOP. These letters were addressed to Pope Francis because they had faith that this world leader would advocate for them. Some Jesuits and I helped forward them to the pope three weeks ago. The pope answered these letters by writing me acknowledging receipt of them and to give hope to those who now have no hope. The pope’s letter is strong and clear. He believes our youth deserve a second chance. Each prisoner who wrote a letter will be receiving a copy of the pope’s letter. As we know, a youth’s brain has not developed to the level of an adult at the ages when they commit these crimes. They should be tried in juvenile courts not adult courts. It is very clear that Pope Francis understands this and has taken this issue of youth locked up as a personal concern. We are grateful to the commitment of Pope Francis. His leadership should influence our political leaders to make the changes necessary so that kids can be treated differently than adults. 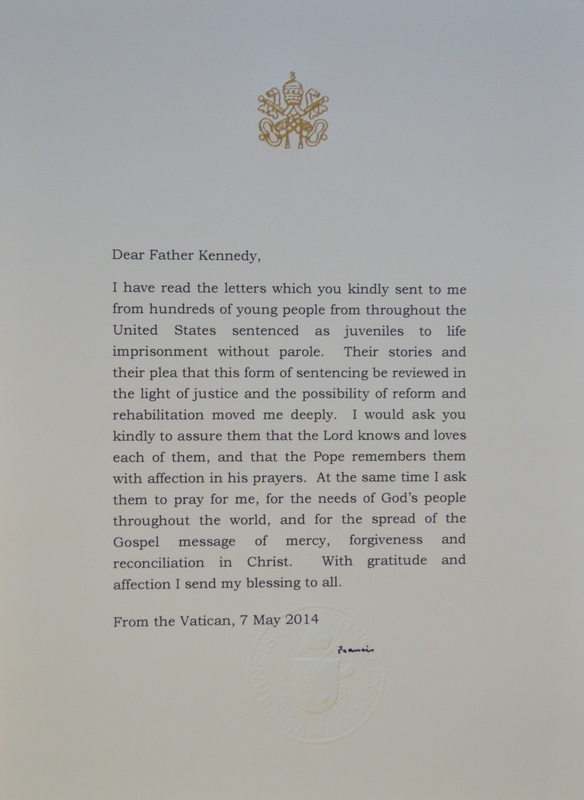 The pope’s letter affirms we need to give to youth who have committed crimes a second chance. Michael Kennedy, S.J., is executive director of the Jesuit Restorative Justice Initiative. Amen, amen, amen! Thank you for this action that you have taken, Fr. Kennedy. Knowing some of these "kids" and their families is so very sad and tragic. Sometimes I think that there is no solution, no way of untying this knot of hopeless despair. The prayer of Francis may indeed move this mountain. I find this post very interesting. Senate Bill 9 also called SB 9 became California law in January 2013. This law gives a second chance to most people who were under the age of 18 at the time of their crime and sentenced to life without parole. They can ask the court for a new sentencing hearing. At that hearing, they will have the chance of getting a new sentence with the possibility of parole. I can really say that Pope Francis truly has a heart for the youth.